BBC coverage: Watch live on BBC TV, listen on Radio 5 live sports extra and follow live text updates on the BBC Sport website. Click here for full details. In the middle of two huge events and some of the biggest weeks of my career, it feels better than ever to focus on my real priority whenever I can. My wife Kim is expecting our first child and it's really nice that when I get home I'm not stressing about tennis, but interested in helping her as much as I can. She has always been great about supporting me throughout my career but the next couple of weeks are going to be stressful, with a lot of big matches. That means getting to spend time together now is especially nice, because Kim's quite far along and we have something more important to talk about and distract us - or distract me - from the tennis. There is certainly plenty of tennis to think about with the Davis Cup final following straight after the ATP World Tour Finals. The switch of surfaces, from indoor hard court in London to clay in Belgium, means everything from my training to my schedule to my daily routine is different this year. I practised on clay at Queen's Club for a few days last week and so I've been coming to the O2 Arena very early in the morning, just to get on the centre court, because I find the conditions there are completely different from the smaller practice courts outside. I only had a few days to adjust and I wanted to get as much time as I could on that court so my timing is as good as it can be. It was a little bit off for a couple of games in my first match on Monday and my returning could have been better, but to beat a guy like David Ferrer in straight sets is always encouraging and physically I felt good, so I'm happy about that. If I hadn't played in London I would have gone into the Davis Cup final without any matches for several weeks, and even though the surface is different, taking on the best players in the world must be great preparation for such a big event. There have been changes off court as well this year with the players staying at the Savoy Hotel for the first time - it's really, really nice. I got told a useless bit of information actually - apparently it's on the only street in the whole country where you drive on the wrong side of the road. I don't know why, and it could be nonsense, but that's what I was told. I've stayed there every night since Thursday and travelled to the O2 by boat, but on Monday I headed home for a night. That means I missed my brother Jamie again - I haven't seen him since the tournament started. He's been at home every night I've been at the hotel, and the night I go home he's at the hotel. This is the first time he's qualified for London and he's had an amazing year, I'm very proud of him, but I'm sure he's avoiding me! I've spoken to a lot of the players and people in tennis about being a parent - when I talk to anyone it's what I end up chatting about - and everyone is extremely positive about having kids. All the players do things their own way: some of them like to travel with their children, some travel together occasionally, some never do it at all. It's an unusual life and you just have to find what works for you. I'm sure we will travel together as a family sometimes but Kim doesn't come to lots of the tournaments anyway just now, and I would imagine that I'll spend a little more time at home at certain times of year in future. In the past, maybe even when I wasn't hitting balls I would head over to Miami early for a training block and train in the gym. In future I might use that week to stay at home, train at the gym here and head over when my tennis starts to pick up. I'm sure there will be a few changes to the way I've always done things but that will be my priority from now on, ahead of tennis. It's an exciting time on and off the court at the moment and I'm looking forward to every bit of it. 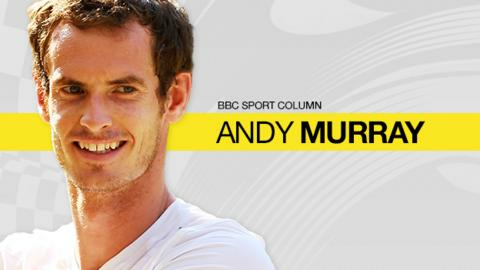 Andy Murray was talking to BBC Sport's Piers Newbery.